There were never one same rice and curry anywhere that we went. Every restaurant had their own version and it was up to them what were the curry dishes they would served. The number of curry dishes offered also varied (I’ve got anything from 3 to 6-7), but there would certainly be curries of different strength of spiciness. I noted there would always be a mild-tasting dhal, and other variation included vegetable curry, meat curry (usually chicken), fish curry, and at times, dried chilli-fried fish and poppadums. Not forgetting, there would also be some sambal, the hottest component to rice and curry, sometimes served in one of the two varieties – coconut sambol (pol sambola) and chutney-like sambal – and sometimes even both. Tongue shall burn! Rice and curry are not for the faint-hearted. For one, the portions served were copious – usually good for two people in my estimation. One look at the small hill of rice, followed by 4-5 smaller bowls of curries, I was sure by the end of the holiday I would be putting on a good few kilos. Notable exception was the rice and curry I had in Galle which was a single plate with the components and none of the little bowls commotion. Secondly, for anyone who’s not accustomed to eating spicy food, the heat may be too much to handle, not to mention this could quickly led to upset stomach. Good thing my Malaysian training came in handy here. Claire had had much less success than I with rice and curry. While I ordered them faithfully in most places that we went to, she settled for other (European) alternatives. Not the she didn’t eat spicy food, but more because she was intolerant to certain spices within the curries. We were not sure which. There were a couple of meals when she polished off the rice and curry without problem, and there were a couple of meals when she had upset stomach very shortly after she ate them (within 15-20 minutes and I was perfectly find despite eating the same things, so we could rule out food poisoning). For the latter part of our trip, she pretty much avoided rice and curry for not wanting to suffer again. Rice and curry aside, I was also introduced to the joy of kottu, a dish with a type of roti at the heart of it. Known locally as gothamba roti or godamba roti, its texture is not unlike roti canai one could get in Malaysia (or at times known as roti pratha, say in Singapore). To make the dish, the rotis are chopped up and you’ll see pieces now resembling strips of kuey teow (flat rice noodle). Fry them all up with vegetables, eggs and spices, voila! What about breakfast then? Given the amount of spices that were liberally dosed into my main meals, could be nice to get a break and get something lighter? No. Way. My favourite thing to eat in the morning were the hoppers. Or as Malaysians would know them as appams. 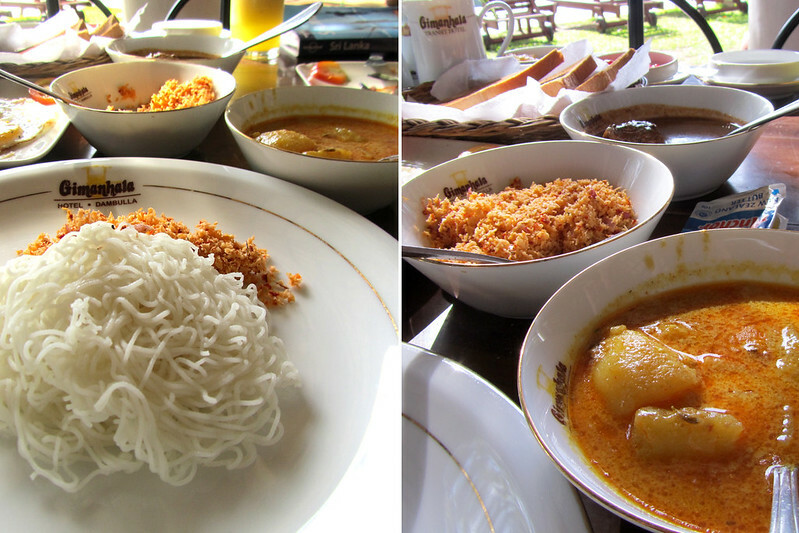 You must begin to see the pattern – I could draw a lot of comparison to Malaysian food! However, when it comes to hoppers, one big difference reins supreme. 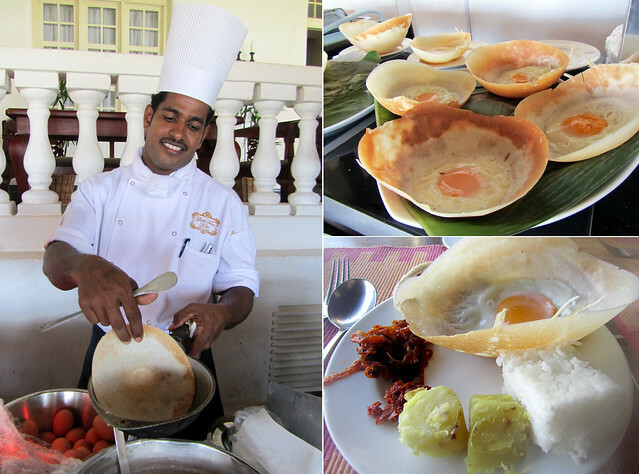 Hoppers are normally served as something sweet in Malaysia; not so in Sri Lanka. They are served as savouries. Bring on the spices. Nothing beats freshly-made egg hoppers in the morning. I had had helpings of them with some sambal, steamed potatoes, coconut rice, and to sweeten it up a wee bit, jaggery. One portion at a time of course. Cold egg hoppers are not quite as delicious as the warm ones. At the same time, it also made me miss the appams in Malaysia that are served with ground peanuts and sweetcorns. Last but not least, possibly the more difficult dish to find among the places that we went, string hoppers. They are all stringy, white, served like discs, and yes, you Malaysians reading this (or people who have been to Malaysia) could have guessed – putu mayam! One of my favourite things to eat, I was really excited to find string hoppers on menu on our first morning in Sri Lanka. Goodie, I thought – I shall be ordering this from now on for breakfast! No such luck. In fact, I didn’t seen it anywhere else again. Boooo. String hoppers could easily be a mini rice and curry; just substitute rice and string hoppers. I was served coconut sambol and potato curry with it. A tad odd as I’m used to putu mayam that comes with freshly grated coconut and palm sugar. Nonetheless, still so delicious, so I happily chomped the dish away. 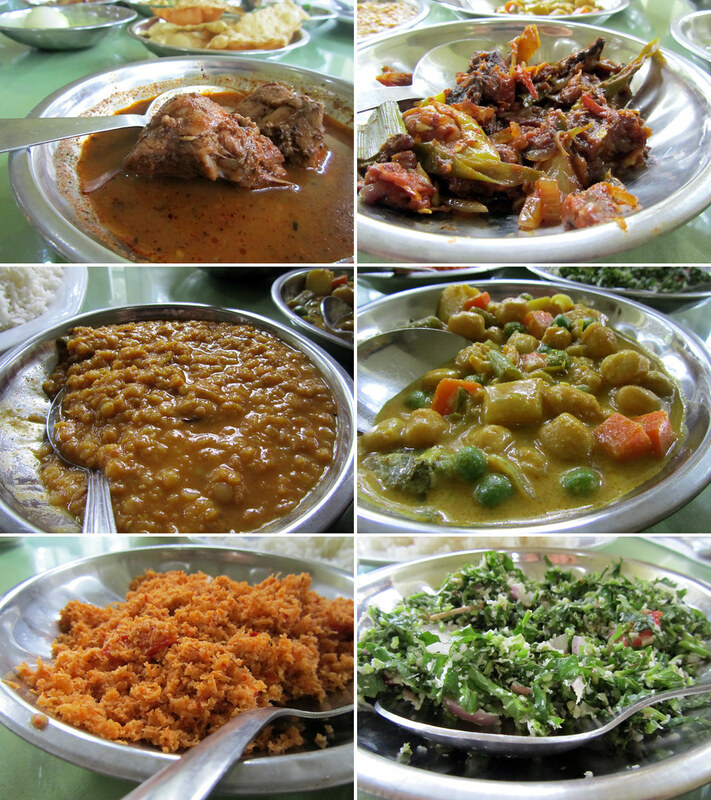 All in all, I had had fun eating what a Sri Lankan would eat on a daily basis. I had very good doses of spicy food and in between, I was mostly sipping away at cold Milo in a box (yes, they have Milo everywhere! ), fresh coconut and or fresh juices (such a wood apple). The one and only bad meal that I was complaining much about would be our horrible sandwich lunch in Tissa. That was something else, really. definitely sounds like lots of good food out there :) though i must admit after a couple weeks, i wouldn’t be too unhappy to get back to some French cuisine :P hehehe. good thing for me, there’s nice south indian food i can find around gare du nord as well, so anytime i need a fix, that’s the quarter where you’ll find me!